Finding a new car is fun, but finding a new car that includes a special offer on its price is exhilarating! 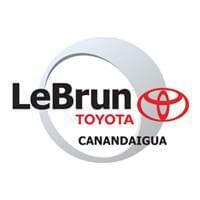 LeBrun Toyota is able to do this and more for you. Check out the available new car specials along with the Toyota Incentives to find all the ways you can save! If you have any questions or would like to schedule a test drive, call our team, fill out the contact form or come visit our car dealership in Canandaigua. We are the trusted Toyota dealership for all drivers coming from Rochester, Fairport, Victor and any other surrounding area. We look forward to working with you!